But in my 25 years of being an art critic and seeing hundreds, probably thousands of shows, I have to say I cannot remember a single example of an artist deliberately scamming the public. On the contrary, no matter how godawful the art, how silly the conceit, how pretentious the content, every single one of them was utterly sincere. 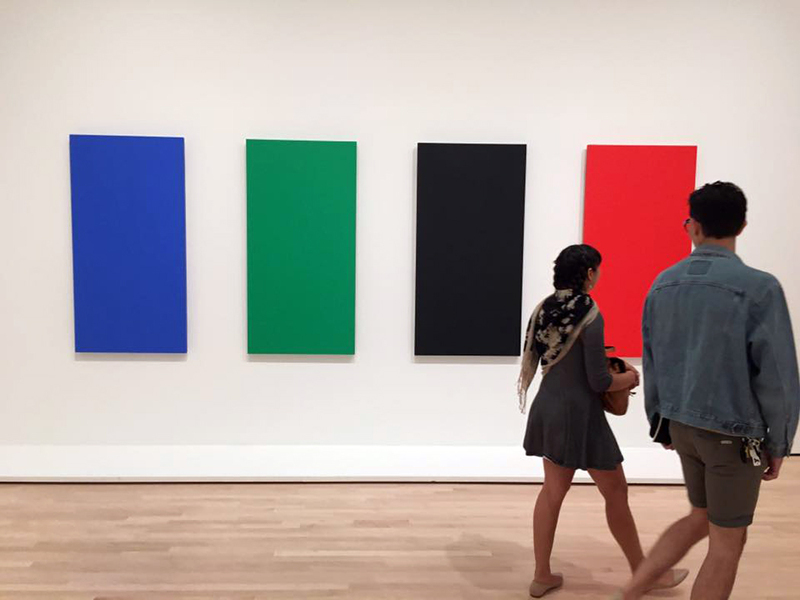 The issue has been raised by my former esteemed colleague, Kerry Lengel, on his Facebook page: “What percentage of Modern art was created for the sole purpose of making rubes like me scratch their heads and go, ‘Whuh …?’ ” Included is the above photo of a four-panel Minimalist artwork. He seems to have addressed this question specifically to me. My initial response to his percentage question was “13.7 percent.” But that was merely facetious. He suggested 40 percent. But my real answer is closer to zero. This is not to exonerate all the really bad art that hangs on gallery and museum walls, but to claim that the miserableness is not by intent. Remember the rule of thumb: 90 percent of everything is crap. (Others calculate that at 99 percent, but I’m not here to quibble). Nor am I going to argue that many arts professionals aren’t gargling jargon and hiding behind graduate degrees and claiming to have arcane knowledge the ordinary art goer is not privy to. Any profession has its shibboleths. I have complained many times about the ridiculous text that curators post beside the art on the wall, claiming all kinds of political and philosophical content in otherwise simple imagery. Such content may or may not be there, but if it isn’t communicated by the art itself, what good is having an explanation next to it? The academic and intellectual world has been infected for the past 30 or 40 years with “theory,” and it has deracinated a good deal of the art, both by explaining away the work, or by substituting theory for actual experience. There is much to be learned from deconstruction or semiotics, but it cannot replace just looking at the art itself. All theory is an attempt to replace living experience with dry words. Language is a way to tame the effusive and prolific chaos of human experience. It is a map instead of a voyage. Let’s take a look at the four wall panels above. First, they aren’t just any colors, but specifically the primary colors of the additive color system, that is, the colors in your TV and computer screen. The blue isn’t any blue, but the almost purple blue, the red is a tomato red. If you look closely at the colors and try to ingest them the way you might a salami sandwich, roll them around on your eyes the way you might roll that deli meat on your tongue, you can simply enjoy their intensity. They are a pleasure to look at. But they may also make you consider the difference between the mediated world of digital experience and the sensuous world that you float in daily. 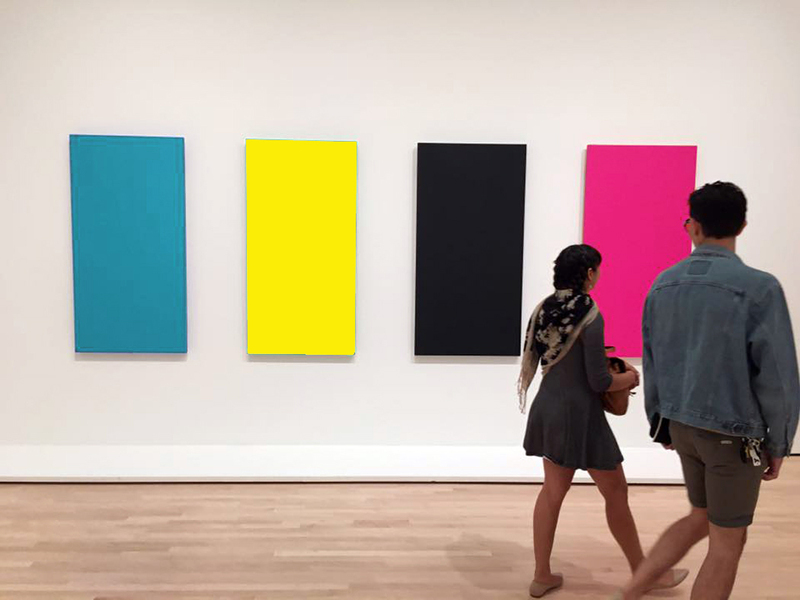 The artist could have chosen the printer’s subtractive primary colors (the colors of the printed page), cyan, yellow, magenta and black (abbreviated to CYMK, where the K stands for black). So, they are not just any colors. You bring to the art your knowledge of the color choices you use daily on your iMac, the same way you bring your knowledge of biblical mythology to the paintings of Titian, or your knowledge of the French demimonde to Impressionists. Further, the rectangular shape of the canvases (or panels, I can’t tell from the photo) is the shape of the pixels on your TV or computer screen. If you look with a magnifying glass at the screen you can see them lined up in register. These four panels seem to be about something, not merely four panels of random colors. 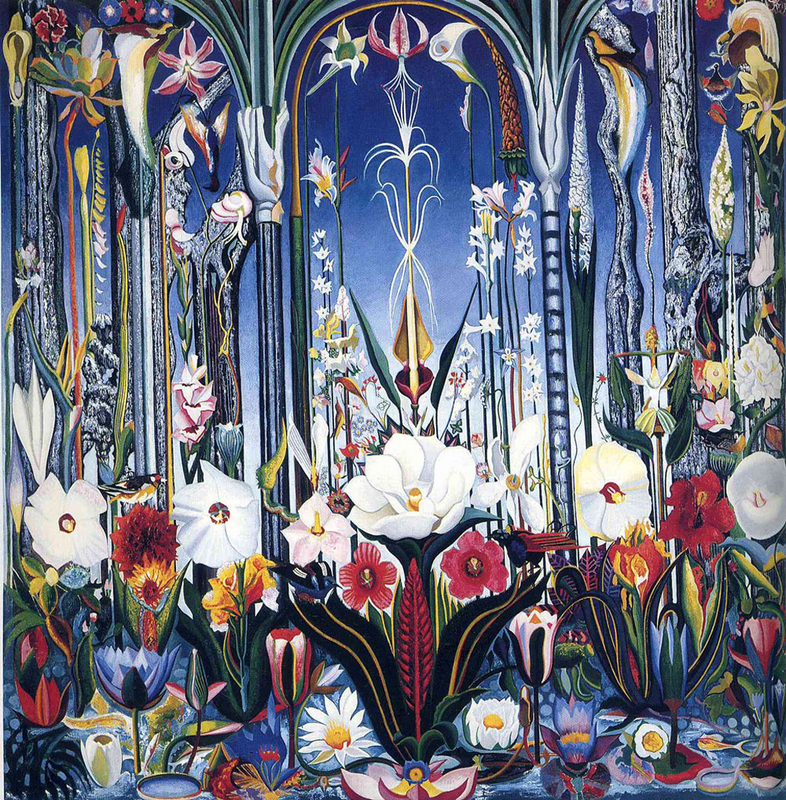 What you make of all this is up to you, but you should not simply dismiss the art. I don’t want to make to great a claim for this specific piece of art, but the artist clearly had something in mind. What we are asked to do by any piece of art is to take it seriously. We may ultimately decide it belongs with the 90 percent that deserves to be flushed away, but we haven’t earned the judgment unless we first allow ourselves to assume its sincerity (even when it is clearly an ironic comment). It’s the art world equivalent of “innocent until proven guilty.” Admittedly, it can sometimes be a short trial, but it shouldn’t be a lynching. It should also be noted that there is a difference between liking a piece of art and appreciating it. We all have tastes and sometimes we like vanilla and don’t like asparagus. But we can recognize that some people love the vegetable. Liking is not a judgment, it is an expression of personal taste. There are many works of art I recognize as important and distinguished but that I have no taste for. I have a personal animus toward all Victorian literature. Can’t stand the stuff. But just because I was put off Dickens by being forced to read Oliver Twist in eighth grade doesn’t mean I think Dickens is no damn good. I just don’t resonate to Victorian writing. I don’t enjoy Browning, either, or Hardy. Liking is merely personal; quality is something else. Samuel Coleridge says somewhere in his Biographica Literaria that there is a difference between “gustibus” and “gusti.” De gustibus non est desputandum, he says is merely the personal liking and disliking of something, but taste, he says, is not like that. It can be cultivated and developed. 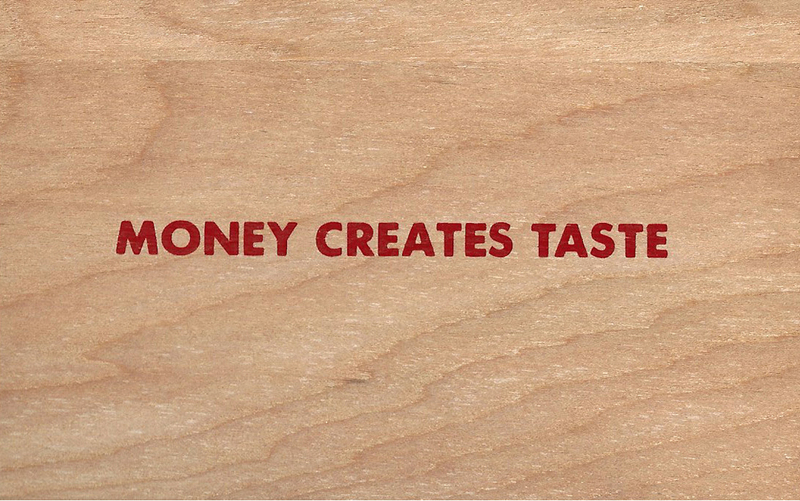 I remember recoiling at the rather glib statement by artist Jenny Holzer that “Money creates taste.” That should be, “Money creates fashion.” Taste is something else. Just ask Donald Trump. Taste requires engagement. Spending time and effort. It is not a question of academic degrees, but willingness and openness; and an ability to forget the myriad conventional categories we have been ground down by. Art that is unfamiliar is usually art that is going somewhere beyond the norm, and invites us to go with it. Engagement — not in the Sartrean political sense, but in the sense of spending your time and attention — is the bottom line both in making art and in perceiving it. Let it absorb you as you absorb it. Seek the pleasure in the simplest things, such as the green; not just any green, but this very specific green. Taste it in your eye. For the time you stand in front of it, let the painting or sculpture, or installation, be everything in the world, a funnel into which you pour your whole life experience, and let it come back out in a torrent. Obviously, you won’t get the big reward every time. Some art is thin gruel. But you should never just assume it is pabulum. It just may prove worth your time. A balanced commentary. It is refreshing to read a critique of art that goes beyond “I don’t get it” and “I don’t like it.” I also feel that not every artistic presentation requires a deep analysis. The apparent hostile comments on a work that is not immediately understood is a reaction to feeling judged. Art is an efficient medium when a thought cannot be perfectly expressed in words. I appreciate simplicity and minimalism in art, so I don’t think that something has to be complicated or dense to be felt by the viewer. De Gustibus for the rest of us. Bring on the aluminum pole, prepare for the feats of strength and the airing of grievances.